Today, we bought our Christmas tree. We don’t have a massive amount of space, and we won’t be here for Christmas Day itself, so we only wanted a little tree, but this one is just the perfect shape. It took us forever to track down where we had packed away the tree decorations from last year – a simple collection of two strings of lights and a pack of red baubles – but eventually we found them. With some Christmas songs playing we were soon feeling festive and had transformed our living room into Santa’s Grotto. Well, almost. So our tree may not quite as lavishly decorated as some, but I like the fact that it’s a work-in-progress. As for today’s pattern suggestion, appropriately enough, it’s the Owls jumper by Kate Davies. It’s fast become a Ravelry classic and it’s not hard to see why. As well as being ridiculously cute (I mean, come on, who wouldn’t want a jumper covered in OWLS for crying out loud?!) 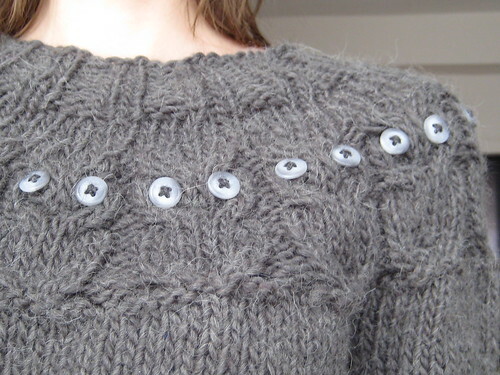 it gives a flattering fit, it’s an easy pattern if you’re new to sweaters, and it’s super quick to make. In bulky yarn and 6.5mm needles, it flies by (pardon the pun), and it doesn’t take that much yarn, so there’s no need to break the bank on the materials. Mine was a stash-bust project with some Rowan Polar I had to hand, but it’s almost four years old now so it’s looking a little tired. Polar is soft and warm, but it’s not the most durable of yarns, which is probably why it’s discontinued. I’ve had Owls in my queue for ages, waiting to make a replacement. Perhaps that will be a good project for the New Year, but if you need one before then, fear not; I had a whole Parliament hooting in about two weeks. This entry was posted in Knitting and tagged Advent 2012, Christmas knitting, owls. Bookmark the permalink. your tree is so pretty! love your two new additions and the photo in the dark with the twinkle lights. I can hear the christmas music playing! What a lovely tree! We got ours yesterday as well and almost didn’t get home with it because of the snow… I love the owl and the hedgehog – they are adorable. I love my Owls vest (I didn’t do the sleeves) as well. Hoot!